What is 'Keeping' an Arsenal fan alive? You are here: Home » English Premier League » Arsenal FC » What is ‘Keeping’ an Arsenal fan alive? What is ‘Keeping’ an Arsenal fan alive? I woke up before the crack of dawn, with awful apprehension and a considerable amount of sweat on my forehead. A crazy dream had resulted in the awakening of the indolent soul that I am, at such an unearthly hour. Arsenal in traditional red and white colors entered the boisterous Stamford Bridge in the last match of the season. They needed three points to win the league, but if they failed to do so, their affluent neighbors in ‘Blue’ would lift the Trophy. The Chelsea starting line-up sprang no surprises, with the usual striking force, the hard-working midfield men and the rock-solid defense absolutely charged up in front of their lively home fans. The Arsenal team comprised of familiar young faces, who were capable of passing the football in an assortment of elegant ways. However, the biggest surprise of all players was standing in front of the Arsenal goal mouth; it was our legendary shot-stopper, Pat Jennings. At 64 years of age, nobody would have imagined that by the end of 90 minutes, he would be the most influential figure in that crucial encounter. The match started with both teams a little skeptical in going forward, exchanging passes with team-mates, intercepting the opponents’ through-balls, and killing off intelligent moves with the slightest of nudges. Suddenly, in a moment of inept madness, when Arsenal’s left full back decided to slip midway on the pitch, Chelsea’s Nicolas Anelka broke through to unleash the ball to his Ivory Coast strike-mate, with only Pat protecting our goal. A stunning full-stretch dive to his left parried off Drogba’s shot, and left the still-lying-on-his-backside-totally-bemused Gael Clichy significantly comforted. The depiction of Frank Lampard, with both hands on the back of his head and in utter disbelief, was vivid enough to question my sub-conscious about the ‘reality of the dream’. The Chelsea men sprang into life, splitting the elderly Arsenal defence with precise passes and testing the legendary Arsenal keeper every now and then. But the old man was not to be overcome so easily; he pulled off save after save, showing incredible positional-sense, smart thinking, agile movement around his ‘den’, and leaving the Chelsea think-tank quite flustered before the sound of the half-time whistle. The second half continued from where the first half had ended, as though the players had never left the field. Drogba, Anelka, Malouda, Lampard, Joe Cole and even Alex tested Jennings from different ranges, unusual angles and better-than-before resilience, but still failed to increment the Chelsea score-line. Jennings, taking a straw out of his ‘childhood love’ Gaelic Football, kept on denying his club’s arch-rivals with stunning saves one after another, each save competing with the previous one in its sheer brilliance. The entire Chelsea troupe was left stunned at the resolve and competence of the Arsenal veteran, while the Gunner boys scratched their heads in disbelief at their former star keeper’s astounding display. The match did have one massive turning point though, when Pat Jennings had to leave the field after 88 minutes, due to high fever, extreme nausea and ‘disgust at the incessant sight of Didier Drogba’. A white-haired, unshaven-for-one-month Spanish keeper replaced the Irish legend, aiming to keep the clean sheet intact and hoping for an Arsenal strike in the last few minutes of the game. Calamity happened! Malouda threw a 30-yard scorcher at the Arsenal keeper, he punched it straight to the ever waiting Frank Lampard, who scored to give Chelsea a lead and an inevitable chance to win the league. That was not the end of Arsenal’s misfortunes – Chelsea managed to score two more via Ballack and a French guy who was a namesake of the Arsenal left full back. The Spanish keeper was taken off in the 93rd minute, and a delusional guy with ‘Polish’ed looks entered the grand scheme of things. Chelsea ended the appalling turn of events with an easy poke for Anelka into the Arsenal goal, while the keeper laid down unconscious, an aftermath of colliding head-on with his disheartened French Center Back when trying to clear the ball out of the ‘danger zone’. Though, John Terry was cheered that day while lifting the Trophy, the only talk-of-the-town was the staggering exhibit of the legendary Arsenal keeper, Pat Jennings. He did everything for his team. He fought till the end, despite knowing that his team was not ‘good enough’. He did the improbable for the Arsenal family, keeping their hopes alive of winning the league. And most importantly, he wore the ‘Arsenal Spirit’. If your name is Joe or Gigi, you are ordained to save this football club. You are going to be an integral part of Arsenal folk-lore. 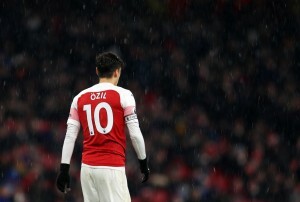 You are going to be a Gunner legend. Be our ‘Knight in shining armor’. Pat Jennings is the besht! Even if he was on a wheelchair or lost both arms, he would still be able to pull off those saves. God save Arsenal if Wenger doesnt get a good PROPER goalie next season. I will stop believing in God! I still dont understand..how come Arsenal have so many young players coming thru but not a GK of quality…??? these spuds to arsenal transfers are usually damn good yeah? any stats off who all has jumped ship? Jennings + Sol Campbell + ?? Typo: It is Jimmy not James Robertson! @shady: From the Youth system, we do have Wojciech Szczęsny who it seems is a brilliant goal-keeper, I am sure he’ll be pulled into the senior team very soon! What happened to Vito Mannone ? @Somnath: Vito did have one good game against Fulham where he was MOM, but soon he started to show his immaturity too! Any case, he’ll stay as no.2 I guess! Yeah, Lloris is in the radar, of course!